Welcome to Push Fitness, Schaumburg’s most established private personal training studio! We offer results-based services in personal training and group fitness classes and we’re ready to get you in the best shape of your life. Check out our Results page to see what other clients have accomplished or browse through our experienced Personal Trainers to find your perfect fitness mentor. 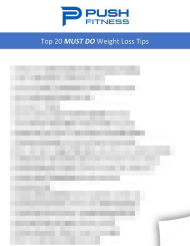 With years of experience in personalized fitness, we developed our programs based on filling several key gaps that plague most other weight loss programs. This has enabled us to get some serious results with our clients – even those who have been unable to find success in the past. We pride ourselves on educating you on the whys and hows, while ensuring that your body gets what it needs to change. Our personal trainers have proven themselves many times over by helping our clients lose weight, burn fat, and increase lean muscle with every walk of life that comes through our doors. We teach you long-term healthy lifestyle habits while ensuring measurable results in the short-term. If you commit to our program, you will come out a different person on the other side. Come in and meet us, tour our facility, check out our programs, and find the perfect fit! Schaumburg, Illinois is famous for the Woodfield Mall, Roosevelt University, many hotels and the Schaumburg Convention Center making it a popular choice for tourists. With a population of over 74,000, there is a good mix of residential homes as well as corporate offices and other service type businesses. Some of the major employers include Fortune 500 Companies such as Zurich, Motorola and Nielsen. With so many great attributes, it’s no wonder so many good people turn to Push Fitness for a comprehensive workout program. 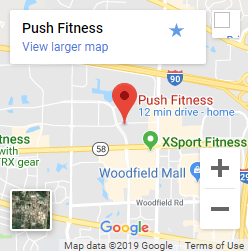 Visit Push Fitness Personal Trainer Schaumburg, Illinois. Our regular scheduled hours are from: Monday – Friday 5:00 AM – 8:00 PM and Saturday’s 7:00 AM – 12:00 PM.